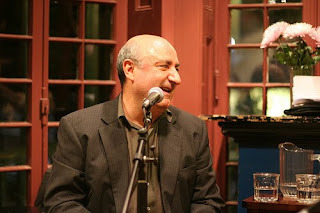 Listen to Anthony DeCurtis read from his writingListen to Anthony DeCurtis read from his writing. He teaches three courses each year through the Center for Programs in Contemporary Writing (CPCW) and the Kelly Writers House at Penn. He's a contributing editor at Rolling Stone, where he has written for nearly thirty years, and his work has also appeared in The New York Times and many other publications. 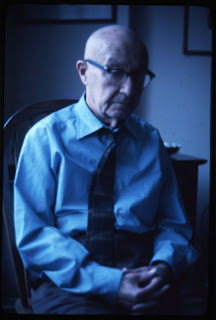 He is the author of In Other Words: Artists Talk About Life and Work (Hal Leonard, 2005) and Rocking My Life Away: Writing About Music and Other Matters (Duke University Press, 1998). In addition, he coedited the third editions of The Rolling Stone Illustrated History of Rock & Roll and The Rolling Stone Album Guide (both published by Random House, 1992), and edited Present Tense: Rock & Roll and Culture (Duke, 1992). Most recently he edited Blues & Chaos: The Music Writing of Robert Palmer (Scribner, 2009). His awards include a 1988 Grammy Award in the "Best Album Notes" category for his essay accompanying the Eric Clapton box set "Crossroads," and three ASCAP Deems Taylor Awards for excellence in writing about music. Anthony holds a Ph.D. in American literature from Indiana University and lives in New York City. At the Kelly Writers House Anthony has hosted our annual Blutt Singer-songwriter Symposium: Roseanne Cash, Suzanne Vega, Steve Earle - and next, Rufus Wainwright. And he is co-director of the RealArts@PENN project. His course the "The Arts and Popular Culture" has become a must-take seminar for young Penn writers interested in criticism, reviews, profiles, interviews and other forms of cultural journalism. 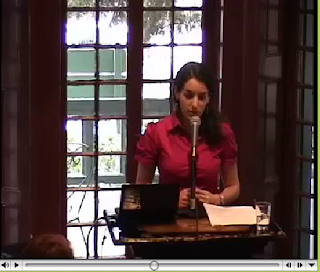 Emma Morgenstern gave a lunchtime talk recently at the Writers House to present her research into the survival of Judeo-Spanish language and culture in GreecEmma Morgenstern gave a lunchtime talk recently at the Writers House to present her research into the survival of Judeo-Spanish language and culture in Greece. She travelled to Rhodes and Thessaloniki on a grant given her through our Heled Travel & Research Grant (made possible by my former student, Mali Heled Kinberg in memory of her mother). Audio and video recordings of the event are now available. Links to both are here. New review to be published soon in Modernism/modernity. Earlier here I posted a draft of the review and got a response from the editors. I enjoyed that exchange.